Stephen and Nellie Kaus – owners and operators of Whistling Thistle Farmstead – are based in north western Iowa in a small rural community called Shell Rock. They met and were married on a vegetable production farm in Amery, Wisconsin in July 2016. 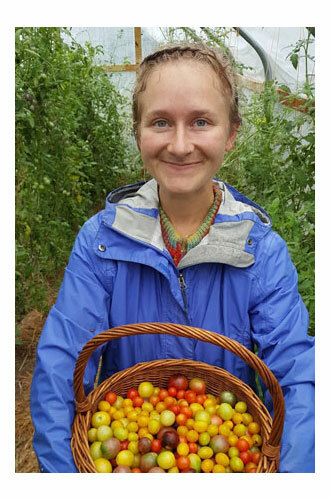 They met while interning at Blackbrook Farm in Amery which produced a large selection of organic annual vegetables, fruits, and culinary herbs along with pasture raised hogs and free range egg laying and meat chickens. While working at Blackbrook, their love for each other and the idea of starting their own vegetable and herb farm began and grew into a reality. 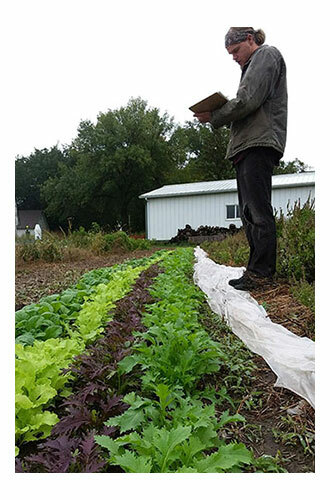 On their last of three seasons working at Blackbrook, they started their own sole proprietor business, Whistling Thistle Farmstead, on one acre and sold their produce at the West Side Farmers Market in West St. Paul, Minnesota and a small CSA mostly consisting of family and friends in the Twin Cities area. This was a great way to start their lifestyle of produce farming and while they loved the location they were in, they started to investigate finding their own land to start their farming dreams. The opportunity arose when Stephen’s parents, located in Iowa, offered their 2.5 acre field and home for their farming practices. So, Stephen and Nellie packed their bags and made the transition down to Shell Rock, Iowa where Whistling Thistle Farmstead is currently located and setting down roots. Their dreams of becoming advocates for justice on environmental, agricultural and social issues are slowly becoming a reality. Stephen and Nellie were both raised in families that did not farm, but their awareness and passion for the environment and the health of our planet sparked a change in their lives. They became increasingly conscientious of what they were putting in and on their bodies as well as the planet. The importance of making certain changes in their own lives like what they were eating, what hygienic products they put on their bodies, medicine, the effects of plastics, industrial chemicals. Their love of spending time outdoors and in the garden grew as they got older and experienced issues with the food system. Stephen Kaus, a Shell Rock native, became interested in farming during his first experience working on a produce farm in Nashua, Iowa on a farm called Bloomin’ Wooley Acres. In a time of being uncertain where his life would lead him, his fellow Shell Rock Spring Swing Show friend Loyd Johnson, offered him a job on his farm. After some experience on the farm he realized his love for working outdoors – even amongst rough conditions, and a love for constantly learning more about horticulture and health. This was his first experience thinking “I could do this for my career”. He continued to pursue internships on other farms after his season at Bloomin’ Wooley Acres, and that lead him to Amery, WI. And the rest is history.